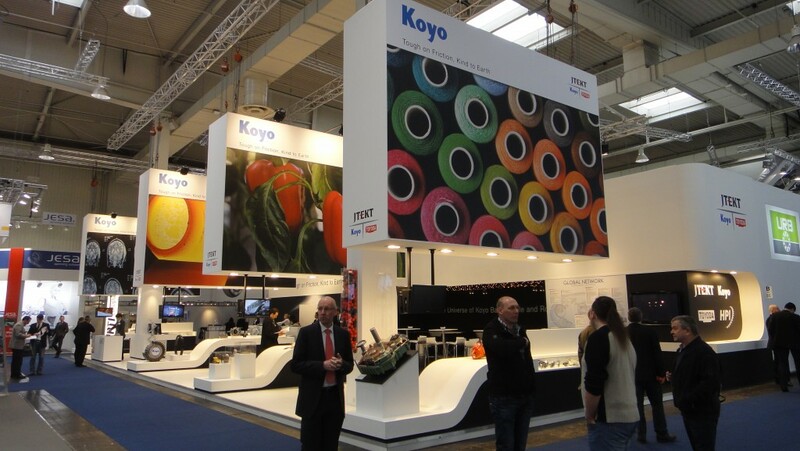 JTEKT was proud to be present again in 2013 at the Hannover Fair, and welcome the visitors to the Universe of Koyo Ball, Needle and Roller bearings. The company was equally showcasing other industrial products from their portfolio, such as the compact hydraulic power packs manufactured by JTEKT HPI division. With 40,000 employees worldwide and a consolidated turnover of 1 trillion Yen (10.5 Billion €), JTEKT is a global supplier of value added technologies to all industries. The design of JTEKT booth, surprising the visitors with brilliant colour, so unusual for this industry, invited the passers-by to come and relax under its starry sky in the lounge area. 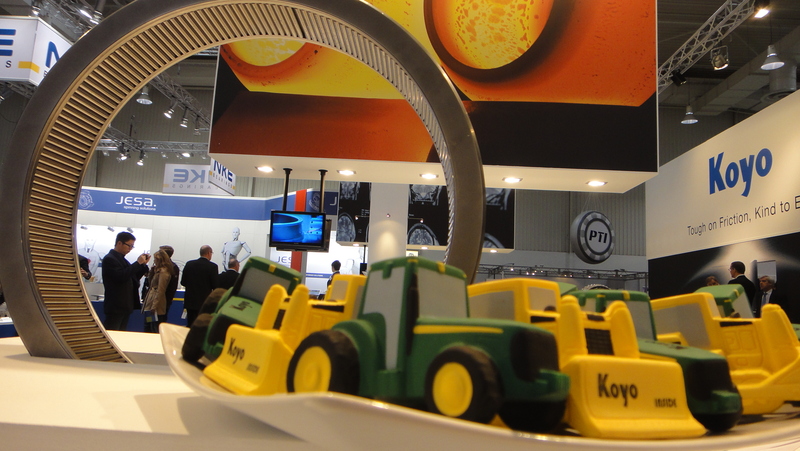 If you took a tour around the spacious stand, you would see Koyo bearings in a variety of sizes and types, and realise they are being used virtually everywhere: from the vehicles you drive, the sport equipment to have fun with, the hand tools to use at home or at work, the textile of your clothes and the food industry (except for the apples available at the bar – no bearings in them according to a company representative). This is a clear signal that JTEKT does not wish to remain primarily an automotive company, but has the ambition to grow significantly in other industrial segments such as Wind, Energy, Steel, Agriculture, Construction, Machine Tools and Textile Machinery. This is their plan especially in Europe, where the industrial segment of the Corporation represents about 50% of the turnover of its bearing division, Koyo. Koyo is equally keen on growing its industrial distribution business in Europe, with a strategy based on “5 pillars”: product range, competitiveness, availability, service and brand image. One of the steps on that road is the acquisition and the integration of the complete range of Needle Roller Bearings in 2010, and a new European website launched in 2011. The Koyo Bearing division is also currently restructuring its European distribution network, in order to improve the coverage of the various European territories, with a view to optimise their service to small and medium industrial customers.